Abstract: Now a days, CD-R and CD-R/RW drives like the SW-216 are easy to come by and operate reliably on IDE. It used to be that only a few people had burners in their systems - and usually SCSI at that. 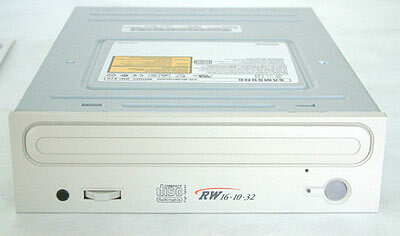 Now a days, CD-R and CD-R/RW drives like the SW-216 are easy to come by and operate reliably on IDE. Larger buffers (8MB in this case) help to prevent errors from occurring during the burn process, but without software like BurnProof, or something similar, caution can't quite be thrown to the wind completely. The SW-216 uses its own version of this technology called Just Link while capably writing CD-R's at a moderately fast 16X write speed, 10x for CD-RW's and while reading at 32X. The front bevel of the drive is a nice change from what we are normally accustomed to seeing, and comes with a headphone jack, volume wheel and eject button. The eject button looks like it should light up from behind, but rather a small LED to the left is used to indicate the status of the drive. The Samsung SW-216 has the standard jumpers in the back of the drive for master/slave/cable select, along with the IDE host connector and the 4-pin power terminal. Alongside those connections in the back of the unit are the regular 4-pin CD audio connector and the 2-pin digital audio output terminal for soundcards and/or MPEG cards which support digital audio features. The packaging and layout are fairly straight forward. The only gripe I have with this packaging is the omission of the 2-pin digital audio cable, which would have been a nice addition. Most manufacturers usually seem to forget to include the 2-pin digital audio cable in their respective retail boxed units as well. Note that the four-pin cable is not shown in the above picture. 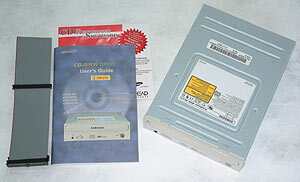 Supported Disc :CD-R/RW, CD-DA, CD-ROM, CD-ROM/XA, Video-CD, CD-I, Photo CD, CD-EXTRA, CD-TEXT. We made sure that the drive was set to DMA to get the best possible results from it. If you are unsure of how to set your drive to DMA a short explanation is included in the instructions. In any case, the first benchmark we used to test the read capabilities of the SW-216 was e-TestingLabs CD Winbench99. The benchmark runs a series of scripted programs from a CD in the drive and measures the time and data transfer capabilities as a result.